Father Michael Oleksa, Ph.D., was born in Allentown, Pennsylvania. He came to Alaska in 1970 from St. Vladimir's Seminary in New York at the invitation of the Alutiiq village of Old Harbor on Kodiak Island. Over the next three decades he served as a Russian Orthodox priest in over a dozen Alaska Native villages. Dr. Oleksa is a storyteller who seeks to foster greater understanding across boundaries of race and culture. Father Oleksa is a leader in the development of cross-cultural education in Alaska, an educator of Alaskan teachers, and a student of Alaska Native languages and cultures. Check out these videos. 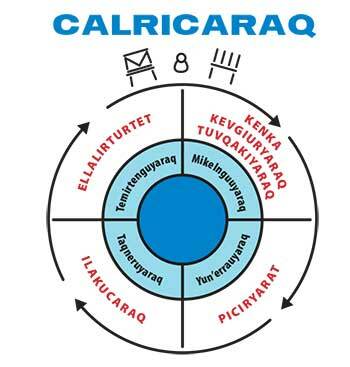 Review this presentation for an overview of Calricaraq, a program to strengthen families and prevent suicide by reaffirming the traditional Yup'ik way of understanding the world and our place in its cycles. This page was last modified on 3 October 2017, at 14:29.